KIEV, Ukraine -- Ukraine President Petro Poroshenko on Wednesday took delivery of 10 US armored vehicles, two days after American lawmakers voted to urge President Barack Obama to provide "lethal" aid to Kiev. 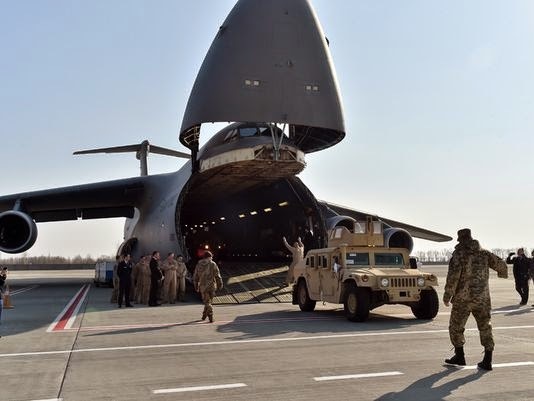 Ukrainian and US servicemen unload Humvees from a plane at Kiev airport on March 25. Dressed in camouflage, the Ukraine leader thanked Washington for the 10 Humvees, the first of 30 promised by Washington, as they arrived at Kiev's Boryspil International Airport. In total, the US plans to send 200 regular Humvees, radios, counter-mortar radars and other non-lethal equipment worth $75 million. The US House of Representatives on Monday voted 348-48 in favor of putting pressure on Obama to ship "lethal defensive weapon systems" to help Kiev forces defend against Russian "aggression". Obama has so far resisted calls to provide Kiev with weapons and other heavy military equipment, but House Democrat Eliot Engel, the lead sponsor of the resolution, told colleagues it was time to stop treating the Ukraine crisis "as just some faraway conflict." The United Nations estimates that more than 6,000 people have been killed in fighting between Ukraine forces and pro-Russian separatists in the country's east since April. Kiev and its allies in the West accuse Russia of arming and spearheading the pro-Kremlin uprising, but Moscow denies the allegation. A ceasefire signed on February 12 has largely held despite sporadic fighting along the frontline.